For years the liberal media (and many of their friends in politics) have attacked Republicans for using any rhetoric that could be remotely connected to violence. Whether it’s words like “taking aim,” or “hunting,” or “firing the first shot,” or “fighting for you,” liberals love to use these words against Republicans and argue that they are “inciting” violence. However, when Democrats literally use violence – whether during protests to shut down conservative speech, or in dramatized form like Kathy Griffin – liberals are suddenly unconcerned about violent rhetoric. You’d have thought that liberals had learned their lesson after watching rapper Snoop Dogg “shoot” a version of the President (dressed as a clown), or Kathy Griffin’s faux-beheading of the President… but no, they’ve learned nothing. How do we know? Because this year’s supposedly a-political Shakespeare in the Park (in Central Park, New York City), dramatizes a very intense, and very graphic scene wherein President Trump gets murdered. Anyone who thinks that any kind of comparison can be made between Julius Caesar and Donald Trump is an utter fool, but Sheaffer is right, celebrating the murder (as noble) of a man that you are comparing to the President of the United States is disrespectful and sends a terrible message. 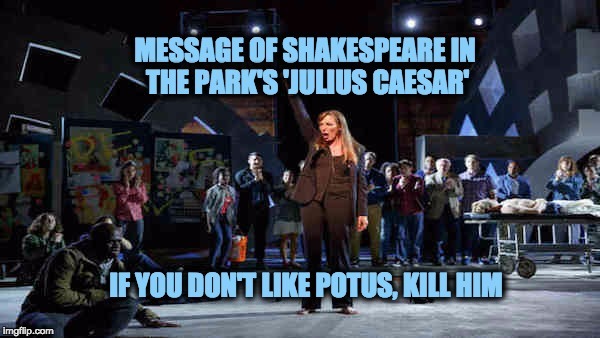 Are the people who put on Shakespeare in the Park arguing that if someone were to murder the President they should be hailed for defending the United States, as Marc Antony hailed Brutus for defending Rome? I truly doubt it. While the decision to depict Trump as Caesar may resonate with liberals (even though Trump has done nothing to deserve the treatment), it’s an ugly and dangerous choice for the producers to make.